It is that time of year for you to have "your turn." Every year in February, the CASE elections are held. This year it is your opportunity to do your part for the organization and vote based on your convictions for President Elect and Treasurer. As always we have great candidates — Gary Myrah (WI) for President Elect and for Treasurer Chris Horton (GA) and Carrie Turner (MO). If you are a current member of CASE as of February 17, 2014 and provided CEC with your email address, you will receive an email with a link to the candidate information and a link to vote. You can find the candidate information now on the CASE website but you can only vote from your link in your email. The email should arrive today or at the latest on Tuesday. If you have not received your email by Tuesday afternoon, email me so I can check on the problem. If you know of CASE members who do not get emails, they can contact the CASE office and receive a paper ballot. The election will only be open through Saturday March 15 so don't put it off. Take your turn and be an engaged and informed member! The election results will be announced at the Annual CASE Member/Board meeting at the CEC convention, Wednesday April 9. I hope you are making your plans to attend the CEC Convention and if so, that you are planning to arrive early enough to have breakfast and attend the CASE meeting. Watch for more details in the coming weeks — see below for the CASE Night tickets! Speaking of attending CEC, CASE Night is going to be a great event as always this year! Just think, heading out to the ballpark with 174 of your colleagues on Thursday, April 10, 2014 for food and a great ballgame! We will have appetizers, dinner, cash bar and lots of fun at a pregame tent party at the Citizens' Bank Park and then we will be sitting together for the Phillies vs. Brewers game! Click here for the flyer and click here to purchase your tickets! CASE NIGHT sells out almost every year ... don't delay on getting your ticket! See you in Philadelphia! Coming soon ... CASE is always trying to improve our services to members. Just in time for the spring job search, CASE will be adding a career center to our website. This will be especially great for our members looking for administrative positions and districts looking for the right match for their vacancies. This service will have a fee attached to it for the districts but we believe you will think it is very reasonable and we believe this will be a site that provides a service to both our members looking for positions and our members looking for personnel! Watch for more details! Every budget, whether it's for the federal government, a local school district, or your family, reflects priorities. But, recent budget proposals put forth by President Barack Obama — and his predecessors — have yielded few, if any, increases for IDEA’s programs, which serve over six million children and youth with disabilities. While the economic stimulus package of 2009 doubled funding for IDEA programs, subsequent funding levels remain far below CEC's recommendations. Recently, the Department of Justice published two new technical assistance documents to assist Title II enti­ties (state and local governments) and Title III entities (businesses and nonprofit organizations that serve the public) in understanding how the rules under the Americans with Disabilities Act apply to them. Both documents are available on the ADA website. The Office of Special Education Programs released Applications for New Awards; Personnel Development to Improve Services and Results for Children with Disabilities — Personnel Preparation in Special Education, Early Intervention, and Related Services which was published in the Federal Register on Friday, Feb. 7 and are inviting new applications for fiscal year 2014. When students are diagnosed with attention-deficit/hyperactivity disorder, approaches that were once excluded from the classroom are now considered a valid option for helping them focus and learn. While the most common solution is medication, school district leaders have become increasingly aggressive in using other measures to improve the learning experience. Families are often not told if their children are being secluded or restrained in schools, they often have problems getting information about the frequency or duration of such occurrences, and current regulations make it hard to fight such practices, according to a majority staff report from the U.S. Senate Health, Education, Labor and Pensions committee. The report was released at the same time that the committee's chairman, Sen. Tom Harkin, D-Iowa, re-introduced a bill that would ban the use of seclusion in schools and severely restrict the use of restraints. He introduced a similar bill in 2012 and 2011. New research suggests that video games may be potential tools for improving concentration and reading in people with dyslexia, offering even more solid scientific footing for the growing number of researchers who believe that the medium has a clear place in 2010s therapy. According to Dr. Vanessa Harrar, a researcher at Oxford University who led the new study, the findings build on the well-documented link between video gaming and sharpened attention skills. In this particular case, we're dealing with something called "cross-sensory shift of attention." More than 1 in 20 American children between the ages of 4 and 17 are medicated for attention deficit and hyperactivity disorder — up nearly 500 percent since 1990. Drugs like Adderall and Ritalin have a reputation as "good-grade pills" and "cognitive enhancers" that produce near-immediate improvements in the ability of children to pay attention in school. The thing is, studies tracing the impact of ADHD meds report no improvement in academic performance in the long term, as Nature reports in a new review of existing research, and kids taking the drugs are in some cases more likely to drop out of school. When students are diagnosed with attention-deficit/hyperactivity disorder, approaches that were once excluded from the classroom are now considered a valid option for helping them focus and learn. While the most common solution is medication, school district leaders have become increasingly aggressive in using other measures to improve the learning experience. Exercise balls, sensory kits and exercise breaks are among the approaches schools are taking to support students with ADHD as diagnosis of the disorder continues to increase in U.S. schools. 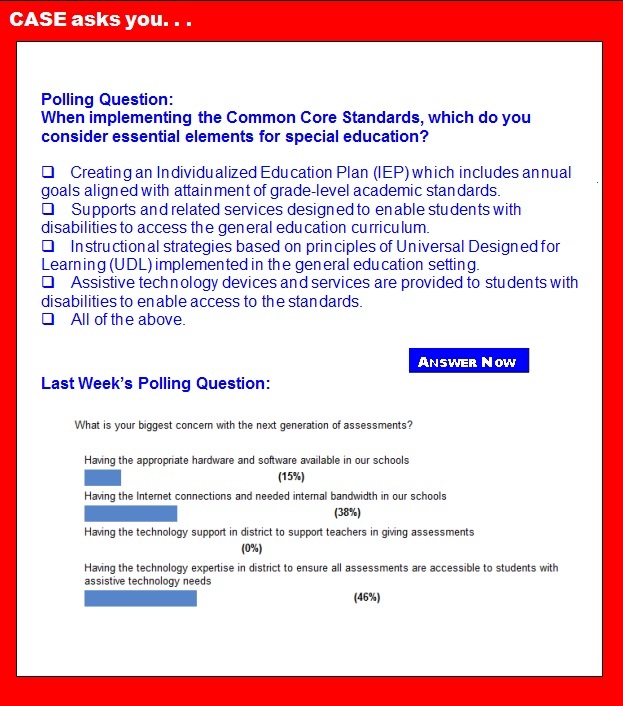 Add yet another anti-Common Core bill from Congress to your tally. Sen. Lindsay Graham, R-S.C., a moderate who is facing a tough primary challenge, has introduced a resolution that makes it clear education is a state issue, and that the U.S. Secretary of Education should not coerce states into adopting common education standards. The resolution — introduced Feb. 5 — also states that the federal government shouldn't give states who adopt Common Core an edge in any future grant competitions. The stimulus package that provided funding for states as part of the American Recovery and Reinvestment Act may have done more harm than good, suggests a new report. Instead of continuing to invest in crucial parts of education post-stimulus, many states have sacrificed fair school funding. During the beginning of the U.S. economy's recession in 2008, the federal government created a stimulus package to support public schools and prevent major layoffs and cuts in essential programs and services through the ARRA. Toxic chemicals may be behind the rising number of children with autism, attention-deficit hyperactivity disorder and dyslexia, U.S. researchers say. Co-authors Philippe Grandjean, adjunct professor of environmental health at the Harvard School of Public Health in Boston, and Philip Landrigan, dean of the Icahn School of Medicine at Mount Sinai in New York, said the study outlines possible links between newly recognized neurotoxicants and negative health effects on children. In the first study of its kind to assess the compounding effects of bullying over 5 years, researchers have found that a child experiences more severe and lasting health implications the longer he or she is bullied, suggesting that early interventions could reverse the "downward health trajectory" that victims of bullying may experience. Results of the study were recently reported in Pediatrics, the journal of the American Academy of Pediatrics. Endowed with a newfound freshman’s hunger for independence, Alix Generous thought she could conquer college without seeking help for the learning disabilities she had dealt with since she was 11. She was wrong. In her first year at the College of Charleston, Generous decided against using the school's assistance programs for students with dyslexia and other disorders, even though she had relied on such help throughout her childhood. "I was like, 'Now I'm 18 and can do what I want.' I definitely had that attitude. But a lot of it also was ignorance," said Generous, who grew up in Maryland. Learning is a culture. It starts as a culture with the students as human beings needing to understand their environment. And it ends as a culture with students taking what we give them and using it in those physical and digital environments they call home. Even the practices that promote or undermine the learning process itself are first and foremost human and cultural artifacts. Literacy, curiosity, self-efficacy, ambition and other important agents of learning are born in the native environments of students' homes. Further, learning is ongoing, perishable and alive — just like culture. What do a high school student who's a bullying prevention activist, two criminology professors, and Safer Internet Day have in common? They're all sending the same message that safety and wellbeing online takes all of us. Aidan McDaniel, the student activist, says school safety happens from the ground up, starting with students. Social cruelty both online and offline isn't a student problem that administrators and teachers can fix from the top down, he told Public News Service. It's "everybody's problem" and the solution doesn't happen "without working with each other." In a presentation he gave last November at the International Bullying Prevention Association conference, Aidan spoke inspiringly about how he and other students train peers to mentor younger students in bullying prevention.